On the issue of having a proper postmortem done to prominent victims of assassinations, one may wonder why Sri Lankans are so allergic. Precedence may have been set with primeminister Solomon Bandaranaike’s murder. It was revealed that in last May, no postmortem was done on the LTTE leader Prabhakaran’s body. Even no postmortem findings were released either after JVP leader Rohana Wijeweera’s death in 1989 or on President Ranasinghe Premadasa’s death in 1993. Consider the following comparable statistic. Between 1964 and 2008, over 30 technical papers have been published on the forensics of President John F. Kennedy's assassination (on Nov. 22, 1963) that occurred four years after the assassination of Prime Minister Solomon Bandaranaike. Not even one technical paper has been published on the forensics of the Bandaranaike assassination. I provide below the details presented by Weeramantry in Chapter 15 of his book, entitled ‘A Foolish Man in Robes’ (pp. 93-100). For illustrative purposes, I also have scanned a sketch of the Bandaranaike residence (65, Rosmead Place, Colombo 7) where the shooting took place, presented in the book between pages 40 and 41. “1. A punctured lacerated wound on the back of the left wrist – an entrance wound. 2. A punctured lacerated wound on the back of the left hand – an exit wound. Injuries 1 and 2 corresponded and were caused by the same bullet which passed only skin deep through the hand. 3. A punctured lacerated wound on the right side of the chest – an entrance wound. 4. A circular punctured wound also on the right side of the chest below injury No. 3 – an entrance wound. 5. A punctured lacerated wound on the left side of the chest below the arm pit – an exit wound. 6. A circular punctured lacerated wound on the right hip – an entrance wound. “Dr. Fernando said that the injuries indicated that three bullets had passed through the body and out of it, including the one that struck the left wrist. One bullet was found embedded near the region of the ninth rib and was removed. There were no marks of burning or singeing anywhere on the skin, which indicated that the muzzle of the weapon had been well over one foot away from the body. Internally, he found injuries which corresponded to the external injuries described by him. They were mostly injuries to the liver, stomach, spleen, intestines and lungs. The injuries were necessarily fatal, and he was of opinion that there was nothing whatsoever that could have saved his life. To recapitulate the details, the prime minister Bandaranaike was shot at 9:45 am on Sept. 25, 1959 (page 54). He then underwent a five hour operation at the Colombo General Hospital, from 11:15am to 4:15 pm (page 94). The following day, on September 26, 1959, Solomon Bandaranaike died at 7:45 am (page 94). And, no postmortem was held! The chief surgeon who operated on PM Bandaranaike was Dr. P.R. Anthonis. Other doctors who assisted Dr. Anthonis were, “Dr. Umagiliya, the anesthetist; Dr. Henry Perera, chest surgeon; Dr. Ponnambalam, another chest surgeon and Drs. Mendis and Yogeswaram, house surgeons.” Unfortunately, excluding Dr. Henry Perera, Weeramantry does not identify other doctors with their first names or initials. Another demerit of Weeramantry book is that a proper index was missing. I provide below, verbatim, the recorded interactions that transpired between Dr. P.R. 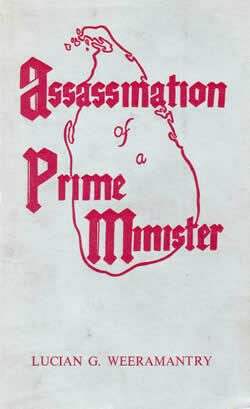 Anthonis and the prime minister, as presented by Weeramantry (pages 93 to 96). “In the theatre he [i.e., Dr. Anthonis] asked Mr. Bandaranaike, ‘Sir, what happened?’ He replied, ‘Doctor, till I saw that black object emerge from the robe, I did not realize what was happening.’ ‘What robe?’ inquired Dr. Anthonis. ‘It was a Buddhist monk,’ was the reply. Feeling Mr. Bandaranaike’s pulse and finding it rising rapidly, he decided not to put him any further questions. After Dr. W.D.L. Fernando, the judicial medical officer, had examined Mr. Bandaranaike’s injuries, Dr. Anthonis began the operation. Immediately anesthesia was administered, Mr. Bandaranaike collapsed due to his low condition. His heart stopped beating and for a moment all seemed lost. Losing no time, Dr. Henry Perera, the skilful and experienced chest surgeon, stepped in and proceeded to give the lifeless patient a cardiac massage, while the attending surgeons and nurses kept casting doubtful glances at one another. But soon, to the surprise and relief of all, the heart resumed its beat. The prime minister had revived! Dr. Anthonis found that there was a very large quantity of free blood inside the abdominal cavity, with the result that only half the normal quantity of blood was in circulation. From the patient’s response to anaesthesia, it was clear that his condition was very serious and the object of the operation was no more than to endeavour to prolong life. Had the operation not been performed, Mr. Bandaranaike would have died within half an hour. The operation, which took more than five hours, was over by 4:15 pm, by which time there was an appreciable improvement in his condition. In non-technical language, the nature of the operation was the stoppage of haemorrhage by ligatures and sutures, or, in other words, the repairing of the perforations and lacerations caused by the bullet wounds. There was one bullet embedded close to the nineth rib, which was recovered by Dr. Henry Perera and handed over to the judicial medical officer. The internal haemorrhage was mostly of the liver, pancreas, spleen, omentum and intestines. Of the vital organs, it was only the kidney and the heart that had escaped injury. After the operation, Dr. Anthonis left the hospital but returned at about 6:30m. He was thereafter almost continuously by the prime minister’s bedside till he passed away at 7:45 am on September 26th. Although the operation had succeeded in arresting the bleeding, its immediate object, it had failed to save life. Cross-examined by counsel for Somarama, Dr. Anthonis said that after the operation the prime minister dictated in his presence a message to be delivered to the nation. He had strongly advised Mr. Bandaranaike against it, but Mr. Bandaranaike was determined to do so and pressed him to consent. ‘Then make it very shrot’, he pleaded, giving his consent with the utmost reluctance. ‘Doctor, I am noted for long political speeches. Please do not restrict me’, was the prompt reply. In the operating theatre stood a man in a surgical mask all ready to take down the message. Mr. Bandaranaike told the man, ‘Do not take it down in shorthand. I want you to do so in long hand and read it back to me.’ The message, which turned out to be a fairly long one, was accordingly dictated and read back. It was subsequently published in all the newspapers. Dr. Anthonis emphasized once more that, although there was an improvement in Mr. Bandaranaike’s condition after the operation, he did not think that he could have survived. He did not take steps to have his dying deposition recorded, because any chance of recovery would have been lost had he been allowed to talk. He was, however, in full possession of his mental faculties to the last. “Constable Samarakone said that at about 9:45 am he heard two shots from the direction of the house. He first mistook the sound for that of bursting firecrackers. As he turned towards the house, he heard two or three more shots. He heard all these shots in the space of a minute. He immediately loaded his rifle and ran in the direction of the verandah. He had not reached the verandah, when an elderly gentleman came running up to him and told him that the primeminister was being shot. As he stepped on to the verandah, he saw a Buddhist monk in the corridor. 1. Circular punctured lacerated wound on the back of the right side of the right thigh. 2. Lacerated wound on the back of the inner side of the right thigh, slightly higher than injury 1. 3. Laceration of the scrotum with injury to the right testicle. 4. Lacerated wound on the inner side of the back of the right thigh at the same level as the injury to the scrotum. Injury 1 was an entrance wound and 2 was the corresponding exit wound. Injury 1 was consistent with an injury caused by a rifle bullet. Its position indicated that the fourth accused was shot from a side. Injuries 3 and 4 were caused by the same bullet which caused injuries 1 and 2. That meant that the bullet, having entered through the back of the right thigh on the outer side, would have emerged from the inner side, grazing the scrotum and the left thigh when making its exit. In addition to these injuries, Somarama had a lacerated wound on his forehead suggestive of a fall or an assault with a rough object, contusions on his head and face suggestive of fist blows, contusions on his chest suggestive of blows with clubs, and a bite mark on his back which turned out to be a grievous injury. (1) As per Solomon Bandaranaike cracking jokes in the operating theatre, that he had ‘a long tongue and plenty of guts’, provided by Dr. P.A. Anthonis (who attended on Solomon Bandaranaike), one may note that the SLFP’s founder-leader did possess some sense of humor. And that he insisted on delivering a public message to the nation (even at his critical hour) proves that Bandaranaike was a supreme politician of a kind. 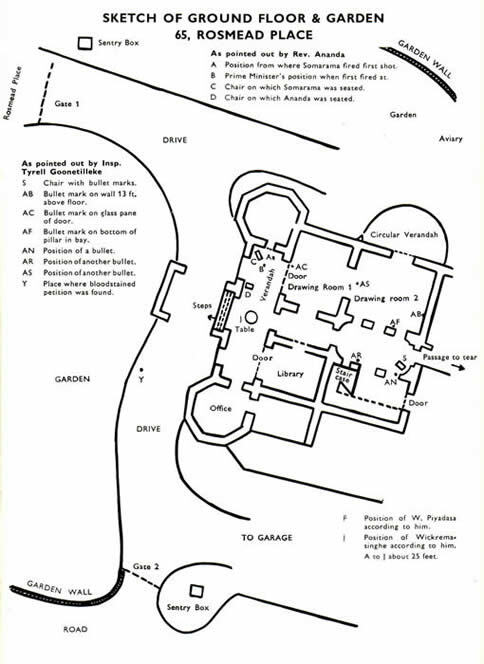 (2) That the two life threatening gun shot wounds in prime minister Bandaranaike’s body were on his right side (thus missing the heart), and none were above the neck, it may be postulated that his assassin Somarama may have been misdirected by the movement of his target or that he simply misjudged the right from the left. (3) The identified gun shot wounds in assassin Somarama Thero’s body indicates that constable Samarakone had primarily aimed at the below-waist region to immobilize his threatening target. (4) On the issue of having a proper postmortem done to prominent victims of assassinations, one may wonder why Sri Lankans are so allergic. Precedence may have been set with primeminister Solomon Bandaranaike’s murder. It was revealed that in last May, no postmortem was done on the LTTE leader Prabhakaran’s body. Even no postmortem findings were released either after JVP leader Rohana Wijeweera’s death in 1989 or on President Ranasinghe Premadasa’s death in 1993.